Few things are more frustrating than misplacing your keys. For all of the precautions we take – easily-identifiable keychains, the hook by the door, copious duplicates – keys always seem to end up missing, especially when we’re running late. The frustration of losing keys is just one drawback of using them, though; for businesses, keys can represent greater challenges, too. Keys can be insecure – easily duplicated, easily stolen. They leave no trace – there’s no way to track who used a key, or at what time it was used. A building secured by physical keys isn’t as secured as it could be. Simply put, in today’s world, keys are problematic. Fortunately, there are now alternative solutions. That’s where keyless entry systems come in. What are Keyless Entry Systems? Keyless entry systems are what they sound like: facility security systems that don’t rely on physical keys but rely on electrical access control instead. These include solutions like proximity-based fobs or key cards, coded systems, and identity-based systems. Each of these solutions has its own strengths and drawbacks, but they all share one common benefit: they don’t require a physical key. 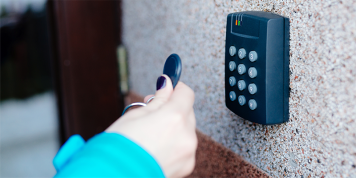 If you’re ready to move to a keyless entry system for your facility, there are plenty of options to select from – and it’s important to note that the implementation of any option will vary from facility to facility, depending on unique needs. With that in mind, here are three keyless entry solutions to consider. AXIS Entry Manager is keyless entry system for your small-to-medium sized business. It’s easy-to-use, simplistic design makes it convenient for business owners that aren’t trying to manage a massive headquarters. The access control box acts as a decentralized unit that can handle two separate doors. By purchasing more controllers, the user can continue to add as many doors as he or she would like. The keyless entry is accessed with key cards used by each employee. Here’s where the customization gets really useful: each employee’s card is saved as an identified user in the control box. Through the box, the administrator can set custom times in which each employee has access to the building. For example, a daytime office worker may have access from 7 a.m. to 7 p.m. while a janitor who works at night may only have access from 8 p.m. to 3 a.m. The system is very convenient in its ease of installation and configuration. The access control box plugs into a computer via ethernet. Then, the user can configure which doors are controlled and where they are within the office. Each door can have its own custom settings. After the configuration, the software can create a map of the office showing where each keyless access point is. Keyscan offers four different control units made for different-sized offices. The different control units come in versions featuring eight, four, two, or one access point. The access points are also able to control elevators, in addition to just doors. Keyscan comes with many intricate features that give it a considerable amount of scalability. The system has expanded flash memory that can support up to 45,000 different credentials (90,000 with an add-on). Its large memory capacity also gives it the ability to keep the past 6,000 entries on file. This means the administrator can access the database to view which users are entering and when, which is a nice security feature. Lastly, Keyscan allows the user to lockdown the entire system on a global scale by integrating multiple systems. With all of these robust features, Keyscan CA is a great keyless entry system for business ranging from medium to large. Pro Data Key (PDK) takes keyless entry to the next technological step: the cloud. The company’s primary system is app-based; employees or building occupants download the PDK “Cloud-node” app and are able to control access through the mobile interface in order to unlock doors as authorized. PDK offers three different types of entry systems that can connect to Cloud-node. The first is Single io, which is simply a single door unit. If you need to control a larger building with multiple entrances, Eight io can control up to eight doors across 10 different floors. In addition to PDK’s keyless door entry systems, PDK also offers Gate io for gated entrances. Gate io has a sturdy lockbox that is suitable for harsh weather. And just like the other systems, it is controlled wirelessly through the app. Keyless entry is a simpler and more secure solution than traditional building access models – but it can be intimidating to navigate, given the abundance of technology and options available in today’s growing market. Hopefully, this short list of solutions has given you a good place to start. If, however, you just want to be sure that you’re choosing the right keyless entry system – let’s talk. At Medlin, we’re experts at helping organizations with system integration, having worked with companies large and small to ensure that buildings work the way they’re needed to. When it comes to keyless entry, we can offer the support you need to make sure that your system is built to your facility to maximize efficiency and security. We can help you choose the right keyless entry system for your facility. And then we can implement it so that it works the way it’s supposed to. If you’d like to implement keyless entry at your facility, get in touch with us.